Whether you have a big business or a small one, it takes a lot of effort to give your business a real presence. It is vital that you exploit all possible chances for you to showcase your product to the public. One of the best ways to do that is to participate in marketing trade shows. There are a lot of advantages to showcasing your product in trade shows. Let’s take a look at the different factors that lead up to a successful trade show. Trade shows are one of the most effective ways to generate leads and introduce your product or company to a wider audience. Attending a trade show can provide a huge boost to your company's sales and revenue; attending a show also gives you an opportunity to talk to other people in your industry and find out where they get their news and tips, how they market their brand, and what other shows or mediums they use to reach their audience. In an effort to keep our customers up-to-date on new products and changing strategies in the trade show industry we are looking at new products such as the Social Media Wall. Modern branding is about a lot more than a logo, slogan, or a clever advertisement. Your company’s brand includes the ways in which you interact with your customers. The Monster Display team has been helping companies with their branding efforts by providing unique and affordable display elements to facilitate customer/company interactions. The recent developments in large scale display screen technology have opened up new avenues of meaningful branding interaction. Large display screens now have the same crystal clear resolution and rich color found on the newest tablet devices and personal computers. Therefore, they are a new avenue to maximize your efforts, incorporating your social media strategy visually with your exhibit. Trade show marketing is an ever-changing business and sometimes you need more than just a great trade show booth. MonsterDisplays.com is providing information about new products that can help make you next trade show a successful venture. The digital revolution has brought a whole new dimension to the art of display design. Touch screen technology has reshaped the way that staff members and attendees experience exhibit spaces. The new Aura Multi-Touch Interactive Display solution caught our attention due to its portability and ease of use, making it an ideal addition to any tech-savvy display you want to create. This all-in-one display system includes wireless controls, versatile applications, and easy handling. Your booth display is one of your most powerful weapons at a trade show, so you’ll want to make sure that you wield that weapon wisely. 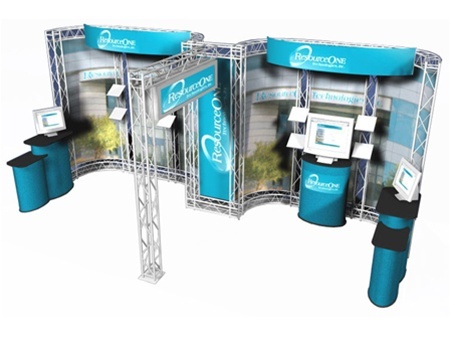 A booth display draws the eye before a trade show attendee even sees the person at the booth. It’s not unusual for companies to spend thousands, even millions of dollars on a Modular display, Truss display or Tension fabric display. Before you devote your entire budget to an expensive display, take a few minutes to think of other things you can do to make your booth display more effective at a trade show. Trade shows are a time for businesses to market themselves, gain new clients, reveal a new product and to just have a good time with like-minded individuals. Not everyone has the same objective in mind when they attend a trade show, but there are a few fundamental ideas that should be kept in mind in order to have a successful trade show no matter what your reasons are for attending. Digital Out Of Home is an industry term that was coined back in the mid-90's for those big electric LCD walls and billboards used on high rise buildings seen in New York City and Football Stadiums. Fast forward to 2013 and it's not just for time square anymore. the advancement in digital technology brings new opportunities for advertisers using digital signage, making campaign creation and updates faster than ever before.